The Shpielmans are a Jewish chasidic family of toy figures and interactive accessories. The Shpielmans figures are unique because they are made with tremendous attention to detail, design, quality, and personality that gives them an endearing quality. 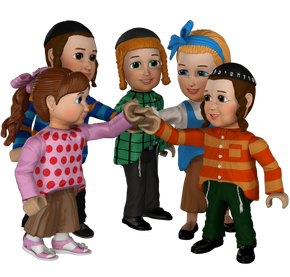 The family pack contains all of the current lovable characters: Zaidy, Babby, Tatty, Mommy, and the children Duvid, Moishe, Ruchel, Shmulik, Rivky and the babies Fayga and Motty! Make the Shpielmans part of your family, and travel along with them as they journey through the Jewish holidays and other meaningful and fun experiences. 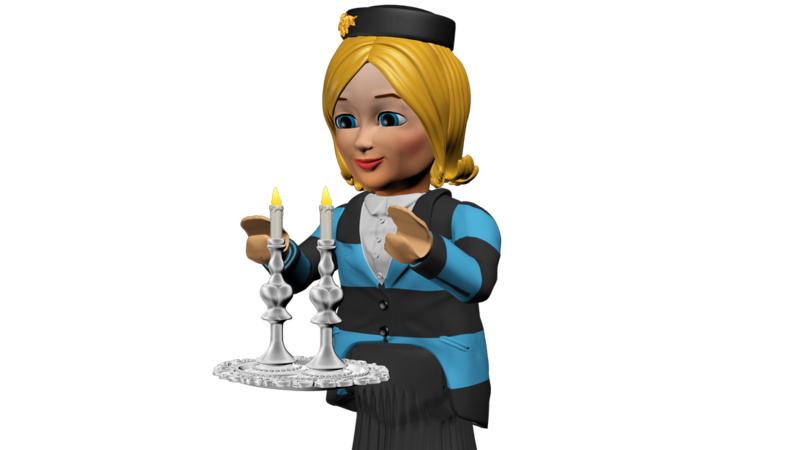 Help Babby light the Shabbat candles, slice the Challah bread along with Tatty, and help Zaidy put on his shtreimel! Take the babies on a stroll with Mommy and the kids. The Shpielmans Family Pack comes with all eleven family members and themed Shabbat accessories. These timeless toys will enhance the play of children from all cultures, as they identify with the underlying themes of giving, friendship, culture and happiness. The Shpielmans promote wholesome Jewish values. They have inspired the imagination, values and creativity of countless children all over the world. Every Shpielmans character has a special role and place in the community, just like the real world! Read about the Shpielmans by clicking here. Connect with their values of family, friendship, sharing and benevolence. The Shpielmans are designed with remarkable attention to detail. The Shpielmans family and accompanying accessories are distinctly creative. The functionality of the figures and accessories makes for lively and interactive play. All the Shpielmans' outfits are uniquely designed for each individual character. I want to buy my child The Shpielmans. How old should he or she be to play with them? The Shpielmans are recommended for ages 4 to 104! The toy is not intended for children ages 3 and under, as it contains small parts and can be a choking hazard. How did The Shpielmans come into existence? The Shpielmans line was created by veteran toy maker Eytan Siboni. Mr. Siboni had a vision to design a toy of the highest quality that would depict the beauty and culture of Judaism. He approached Isaac Abramchayev with his idea, who then showed it to his partners Dr. Winiarsky, Dr. Lewin, and Dr. Horowitz who all loved the details and intricacies of both the design and the functionality of the toy. Every piece is hand painted and each accessory represents a religious article and fits perfectly in the hands of the figurines. Using only the finest materials, the figures are so realistic the consumer can almost sense their individuality. Together, Mr. Siboni and his partners hope to bring a higher appreciation and understanding to traditional Jewish values. Their ultimate goal is to create similar toys of various cultures helping educate and eliminate prejudices. On behalf of The Shpielmans we invite you to try our toy and hope that you and your family will enjoy it! Are there other types of Shpielmans products I can buy for my child – books, puzzles, etc.? If you visit our website, www.theshpielmans.com, you will find coloring activities and videos for your child to engage in. These are free. Stay tuned for additional exciting products! Where can I buy The Shpielmans? The Shpielmans are available at theshpielmans.com/shop.html, Amazon and local Jewish toy and Judaica stores. The Friday evening prelude prayer to Shabbat. Literally means "Receiving the Sabbath"
A fancy goblet used for drinking wine in Jewish religious ceremonies on special occasions such as wedding or in the blessing before the evening meal preceding each Sabbath or holy festival.